The Bano Foundation and the City of Padua are hosting an exhibition of paintings by Joan Miró at Palazzo Zabarella, in the city centre, from 10 March to 24 June 2018. Organized by the Serralves Museum of Contemporary Art in Oporto, Joan Miró: Materiality and Metamorphosis brings the hugely important Miró Collection to art lovers outside Portugal for the first time. The exhibition comprises eighty-five works ranging from paintings to drawings, sculptures, collages and hangings belonging to the magnificent collection of the Catalan artist’s oeuvre that now belongs to the Portuguese State. In his exploration of materiality, Miró delved down deep, unequalled in his research by other artists, with the possible exception of Paul Klee. Certainly Miró greatly expanded the technical confines of twentieth century artistic production. The exhibition bears witness to Miró’s artistic metamorphoses in the fields of drawing, painting, collage and wall hangings through its focus on the transformation of pictorial language developed by the artist from the early 1920s. The stunning sequence of works on show illustrates the artist’s visual thought processes, the way he involved all the senses in his work, from sight to touch. In so doing it also reveals the way his creations developed from original inspiration to finished work. There is a troubled tale with a happy ending to the Miró Collection on show in Padua. The works once belonged to the Banco Portugues de Negocios, who purchased then between 2004 and 2006 from an important private collection in Japan. In 2008 the Banco was nationalized by the Portuguese State, whose own financial problems suggested the prestigious Collection should be sold. The plan was that Christie’s should put them up for auction in London in 2014. This led to an immediate outcry, and the auction was first postponed and then called off, so the Miró works remained in Portugal, where they were later shown at the Serralves Museum in Oporto. Before reaching Padua, the collection was also hosted by the Ajuda National Palace in Lisbon under the same title, Joan Miró: Materiality and Metamorphosis, an event that proved to be one of the most successful exhibitions held recently in Portugal. The exhibition at Palazzo Zabarella covers six decades of Miró’s career as an artist, from 1924 to 1981, and focuses in particular on the transformations of pictorial idiom that began in the early 1920s. These are revealed in the different techniques he used, from drawing to painting, collage to textiles, where his distinctly sensorial approach to creativity is also evident. During the course of his career, Joan Miró (1893-1983) always insisted on the importance of materiality in his work. While he did not consider his materials to be constraints, there is no doubt that the physical substratum of his art made a decisive contribution to what he portrayed. Moreover, it is interesting to note that even works that appear to be extremely simple and spontaneous were often preceded by detailed preparatory drafts. 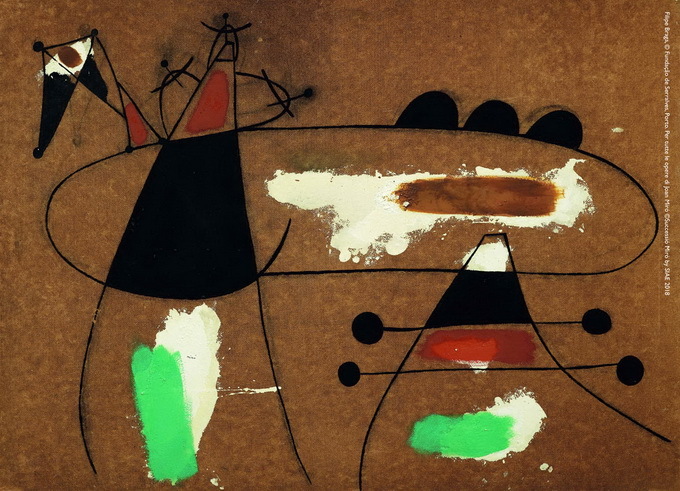 In his creative life Miró worked with a wide range of supporting materials, some of them traditional such as paper, wallpaper, parchment, wood and cardboard, and other less conventional supports that included glass, sandpaper, hemp, cork, sheepskin, asbestos, brass, chipboard, Celotex, copper, aluminium foil and tar paper. He developed these substrata using oils, acrylic colours, chalks, pastels, Conté crayons, graphite, egg-based tempera, gouache, watercolours, enamel paints, Indian ink, collage, prints and stencils. These he applied in an innovative manner to both traditional and unorthodox bases, which he often further developed with the inclusion of pieces of everyday objects such as linoleum and string. Within the sphere of 20th century modernism, Miró played the dual role of both painter and anti-painter, thereby challenging the very concept of material specificity. The Padua exhibition bears eloquent witness to the wealth of inspiration and creativity behind his work in all genres and materials.